There are more benefits than you might think to a loft conversion, the most obvious being an increased amount of space in your home. Whether you want to create a new bedroom, a games room, an office or a bathroom, a loft conversion makes all of these possible. You can improve your lifestyle and even increase revenue by renting out the extra room. With the housing market still slightly unsteady, many people are choosing to expand the space in their current home rather than looking for a new one – and a loft conversion is one of the easiest ways to do this. Why not make the most of the space you already have? By doing so you will increase the amount of space available in your home – and the value of your house should reflect that. Although we cannot guarantee this as each property is different, it is a common trend that we have seen many times in our years of providing loft conversions. 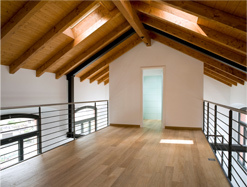 Housing Market Research has also shown that house value can be enhanced by up to 20% by installing a loft conversion! Installing a loft conversion could improve the exterior appearance of your home and in most cases won’t require planning permission – saving you time and money. Interloft are experienced at fitting loft conversions and offer a ten year guarantee on every installation, allowing you complete peace of mind that you’re investing in the very highest standards of service. Our fully comprehensive service includes everything from concept to completion – and we never work with sub-contractors so you can be assured of a friendly, professional and reliable service. As loft conversion specialists in Yorkshire, we are accessible to a wide range of areas including Leeds, Harrogate, York, Huddersfield and Hull to name but a few, and have completed countless projects across the region that have resulted in beautiful loft conversions that have improved our customers lifestyles and properties for the better. For a free, no obligation quote for a loft conversion in your home, please contact us.